@nekrosoft13: Please do not attach images to your posts, their approval takes time until a moderator notices. Instead, upload it to a free image hoster (e.g. frupic, tinypic, imgur ...). with ""C:\Program Files (x86)\RipBot264\EncodingServer.exe" EncodingServer.exe /node 1 /affinity 1"
nothing... maybe i'm not doing it in right place? This is Server 2019 btw. It should be without EncodingServer.exe! My example was for pure command line in case if want to manually run server outside ripbot264. Last edited by Atak_Snajpera; 2nd January 2019 at 16:09. Can you please explain the colors green, blue and grey on the graphic? What is the button next to the OFF? Button next to off button is for auto-reconnection. and the results of .ini file. 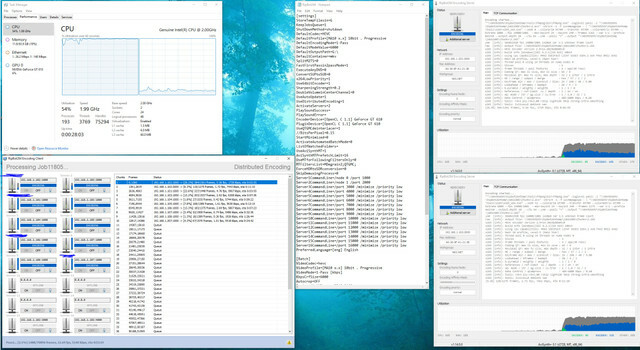 Can you check how EncodingServer.exe processes were assigned in Task Manager? Could you also reduce number of active cores per CPU from 12 to 8 in BIOS and then check if numa node is detected correctly? Last edited by Atak_Snajpera; 2nd January 2019 at 18:26.
can't change BIOS settings at the moment, i'm remoting in at the moment. Let me know once you can do this test. I have some suspicion about 32 thread limit in 32 bit process (EncodingServer.exe) using windows GetNumaProcessorNode function. Last edited by Atak_Snajpera; 2nd January 2019 at 19:19. New test was only with one PC, but with two encodingservers on that client. Running one encodingserver (with opencl) I got 45% CPU usage, 2% GPU usage and around 5.82 fps average. Running one encodingserver (without opencl) I got 100% CPU usage, 0% GPU usage and around 8.94 fps average. In taskmanager x264 task without opencl was allway higher in CPU %, regardless if I changed priority from low to normal of x264-task with opencl enabled. Haven't checked powerconsumtion of different usage cases, but it seems, not using opencl is with my config (2700X and RX550) better for performance. Don't know if other GPUs cause similar results. Last edited by Wishbringer; 3rd January 2019 at 10:29. I discovered RipBot264 in the last days, it's a great piece of software. The most useful feature for me is the HDR to SDR conversion for UHD, so I can view my UHD-rips on my 4K-capable, but non-HDR-TV (LG 79UF8609 from 2015, 3D was more in the focus than HDR). it is amazing to do only one click in settings and the HDR2SDR-process is enabled. The network encoding is also a very nice and unique feature. For shows that have every noise, I've been using mdegrain2 and hqdn3d with 4,4,2,2 or something similar. Ad add the temporal at half or less then half of the chroma and mono.